Our commercial aviation pilot training school offers you a variety of modern airline pilot theory training classes. To learn more, please review the pilot courses that we offer below. Take your ICAO compliant aviation English test using the Jeppesen testing and assessment solution. 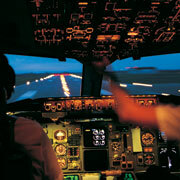 Prepare yourself for the written exam leading to issuance of the Airline Transport Pilot license. Learn the fundamentals of international flight operations. Take a course that takes into account your specific cultural and historical norms. Examine the details and information found on our charts and in our Jeppesen Airway Manuals. Have an understanding and knowledge of the emerging and increasingly complex international airspace systems. Study the practical aspects aircraft certification regulations and airline operating regulations. We are in a unique position to utilize our expertise to offer you customized development of courseware for all of your training needs. Two of the most trusted names in aviation have joined together to offer three new exciting and engaging diploma programs designed to develop the operational and managerial skills of tomorrowýs leaders.